Twist N Smash'd is closed. Hamburgers. Like pizza, they're easy to find and it's rare that they stand out. 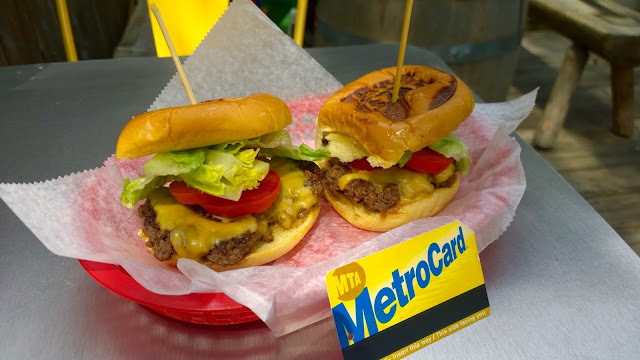 So it is with great joy that we now have three acclaimed hamburger spots here on Austin Street. Bareburger, Shake Shack, and Twist & Smash'd. They've all had great press, they're all delicious, and they're all within a block of one another. 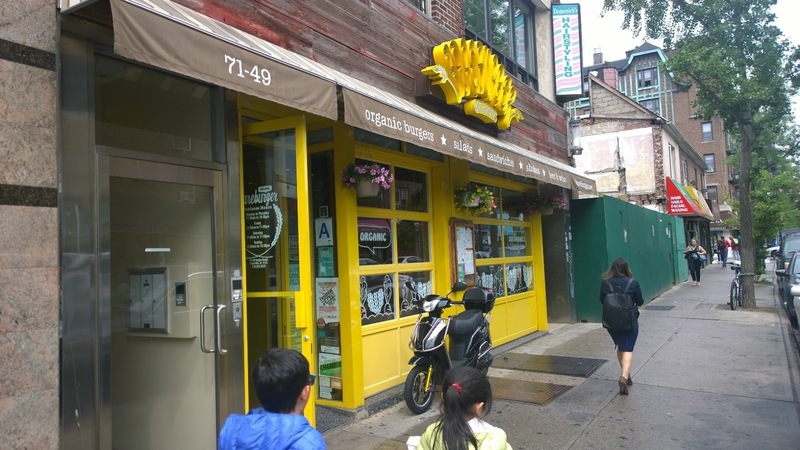 For science, I went to all three in three days and ordered their regular, no-frills cheeseburger, and compared the differences between the three restaurants. Which one is right for you? Read on. FYI: I ordered cheeseburgers because a hamburger without cheese is just ridiculous. Time to arrive: 7 minutes. Bareburger is the most mature of the three. It's a sit down restaurant with a full liquor menu. In keeping with its organic, grass fed, wild game burger menu (elk, bison, etc) the interior is designed to be reminiscent of an Oregon log cabin. Bareburger sells cocktails, wine, craft beer, shakes, salads, serves brunch, has a kids menu, and they cook the meat to order. Because they have table service, you don't place your order and then go hunting for a table while your food gets cold. I ordered the Standard Burger, which comes with pickles, onion, and a tangy sauce, but no lettuce and tomato. My diet root beer came with free refills. At $10 for the burger, this was the priciest of the three places, and once you factor in tax and tip, it's $13. 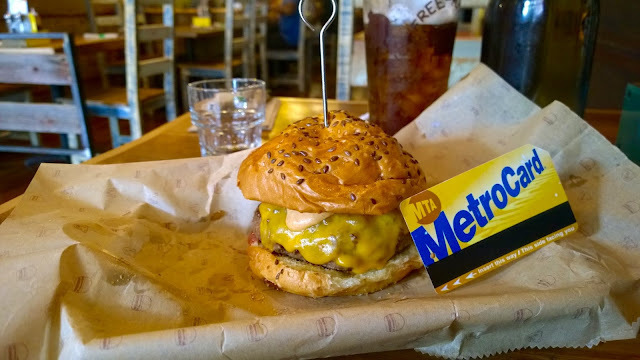 On the upside, despite what the Metrocard comparison implies, the Bareburger burger is about double the size of the others. They use a full sized brioche bun and the patty is a solid inch thick. The Bareburger burger is a meal, not a snack. Time to arrive: 10 minutes. Shake Shack is the most recent addition to the block, and the most famous, being started by restaurant mogul, Danny Meyer. (I guess we lose Danny Brown, and get Danny Meyer?) The interior is modern, sleek, and minimalist, but heavy on reclaimed wood. 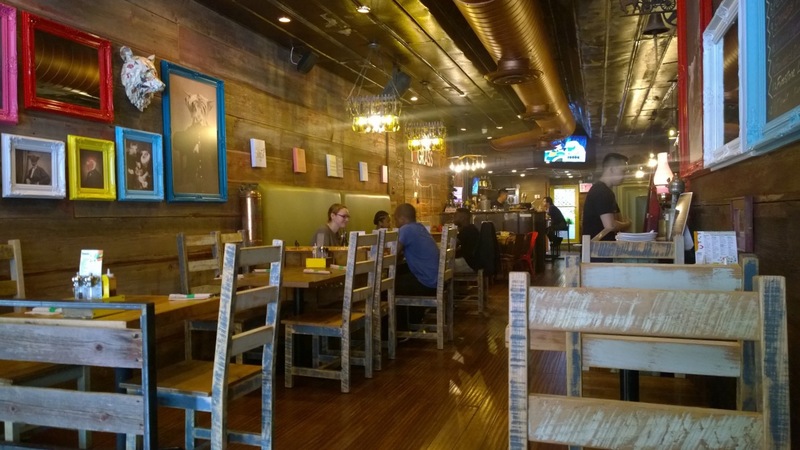 Utilizing the old Strawberries store space, there is a lot of indoor seating in the back and on the second floor. This was still nowhere near enough however, with lines opening weekend stretching out the door and down the block. I was told that 45 minutes to an hour was the norm. Then you can seat hunt. 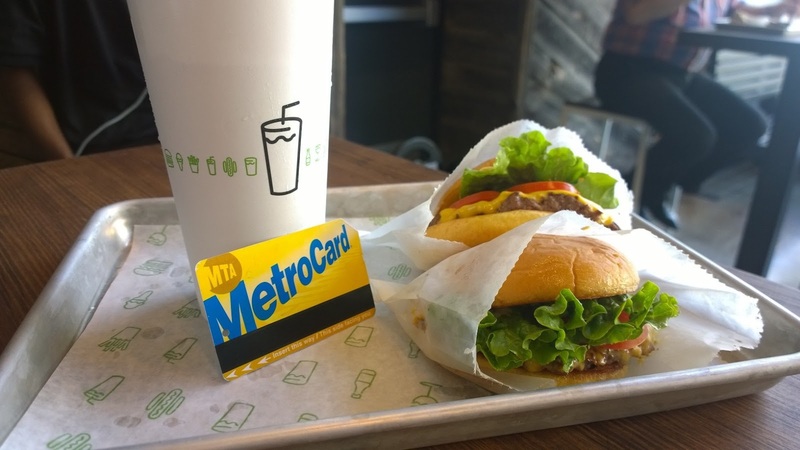 Shake Shack is fast food for grown ups. Hormone-free meat, hot dogs, shakes, chicken sandwiches, the typical fast food menu. But they also serve beer and wine. Still, you order from the board and seat yourself. And not for nothing, the ten minute wait, which was when they were not full to bursting, was slower than Bareburger. 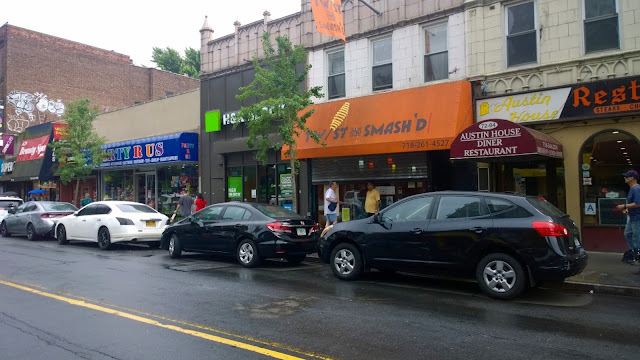 Twist & Smash'd started here in Forest Hills, got good press, and expanded into Astoria. 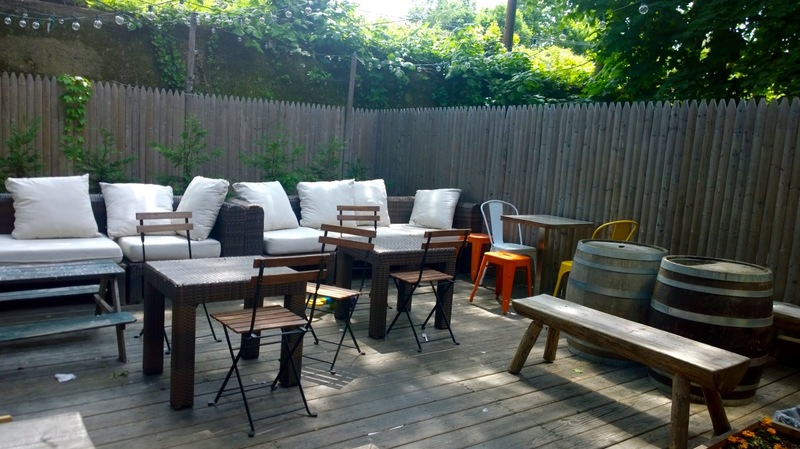 While this location is (very) small and has a limited menu, the Astoria one is massive, is a sports bar with bocce, beer pong tournaments, beer for drinking, an expanded menu, and brunch. The burgers at Twist & Smash'd, made from Angus beef and served on a potato roll, are fantastic with a but. But: they're a bit greasy, they're very small, and they fall apart. From a construction perspective, the rib of the lettuce and the cap of the tomato should never be used. 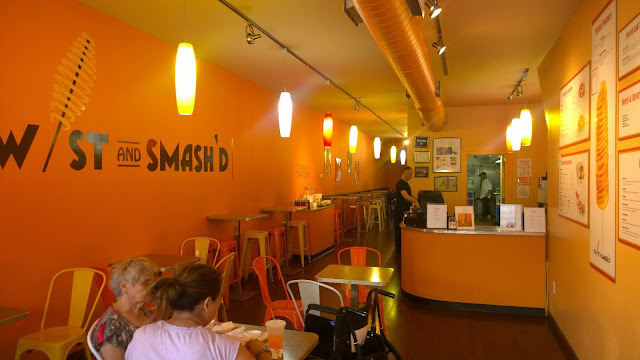 The Twist & Smash'd physical space is, as I mentioned, small but it does have a rear patio area that is nice in good weather and has some games if you have little kids who want to play. I wish that the interior was brighter and had better air conditioning. The vibrant orange paint is light-absorbing and oppressive. If it was a nice light blue or light grey and bright, the orange tables would be a happy contrast, and it wouldn't feel like the ceiling was caving in on you. Twist & Smash'd is the least crowded of the three despite its amazing burgers, and I'm willing to bet that this is why. Having nothing to drink other than iced tea and lemonade doesn't help much, either. The biggest shock was that Shake Shack wasn't the clear winner. I mean, a year ago when I did my Fast Food Burger Smackdown, Shake Shack got the gold. Having tried all three within hours of each other, the Shack was actually the least flavorful. Perhaps this was a one time thing, perhaps we've succumbed to the hype, or perhaps when you compare it to Wendy's and Checkers it's not really a contest. This isn't to say it wasn't delicious. It was. I ate two of them and I'll eat more if the wait time isn't 45 minutes. I imagine that this will subside as the novelty becomes the norm. Twist & Smash'd was the clear loser for interior design. Forget their lack of having a soda fountain. It's almost like they don't want anyone sitting and spending time there. 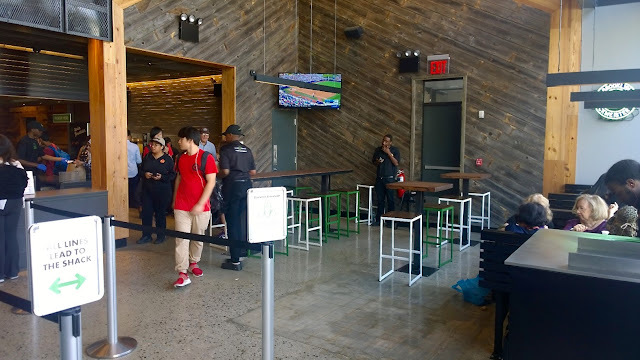 Unlike Shake Shack, which has vast windows and tons of light, Twist & Smash'd is dark and uncomfortable. But the burger was amazing. In fact, the burger would have maybe even won if only it didn't dissolve into mush like a sugar cube in the rain and wasn't so small. It's basically an oversized slider. Bareburger gets the win. The burger is pricey, but it's big, you're guaranteed to have a seat while you eat it, the space is inviting, the meat is cooked to order, you can have a beer or a cocktail, it's kid friendly, and the burger is, of course, delicious (or it would have joined Cheeburger... not in this article). The downside is of course that you need to commit real time to eat here. 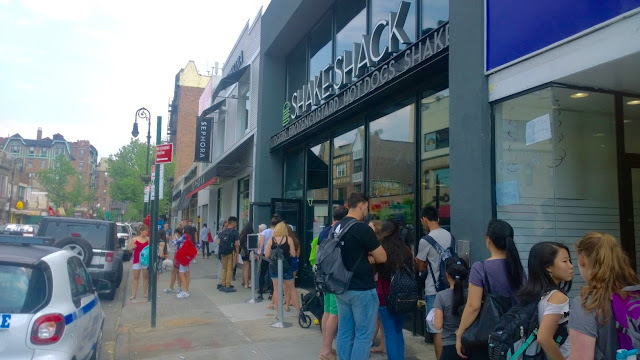 Even though the time to get the food was actually shorter than either Shake Shack or Twist & Smash'd, given that it's a full-on restaurant, you can't just rush in and rush out. Feel free to leave polite comments!